Although reports trickling in are raising questions around Pinterest’s ability to convert its network of enthusiastic photo sharers to e-commerce shoppers, the site itself is still growing quickly. According to new data released by Shareaholic this morning, Pinterest has beaten out Yahoo organic traffic, making Pinterest the fourth largest traffic driver worldwide. In addition, the company found that Google, Yahoo, and Bing organic traffic decreased by 15.63% on average since January, which the firm speculates may indicate more people are discovering content through social sites like Pinterest. But it could also be because Shareaholic’s data, which comes from a network of 200,000 publishers using its social sharing and content analysis tools, is more likely to reflect an engaged community where people are comfortable with using social networking sites to perform searches. In other words, it’s not a big picture study here – just a slice. That being said, Shareaholic predicted Pinterest was on track to pass Yahoo organic traffic back in August, after watching trends on its network related to the social network’s growth. From May to June, Pinterest’s referral traffic grew by 43.7% and from June to July, it grew by 15.97% – a slowdown, yes, but still a decent climb. 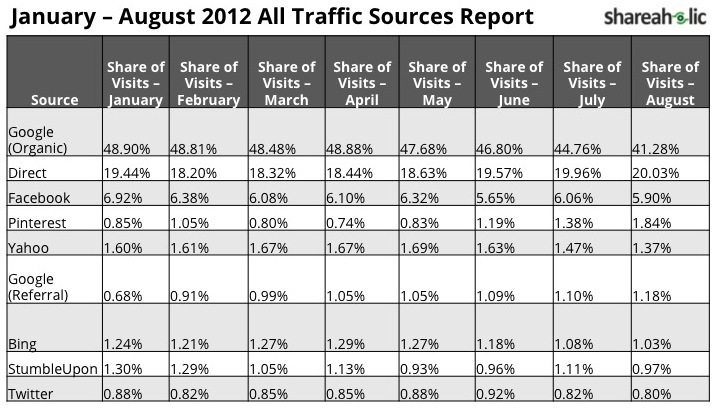 And from July to August, Pinterest grew again, this time by 33.33% – that is, by 1.38% of the traffic to 1.84% of the traffic. The social network also sent more referral traffic than Google+, LinkedIn and YouTube combined in January, Twitter in February, and StumbleUpon, Bing, and Google referral traffic in June. 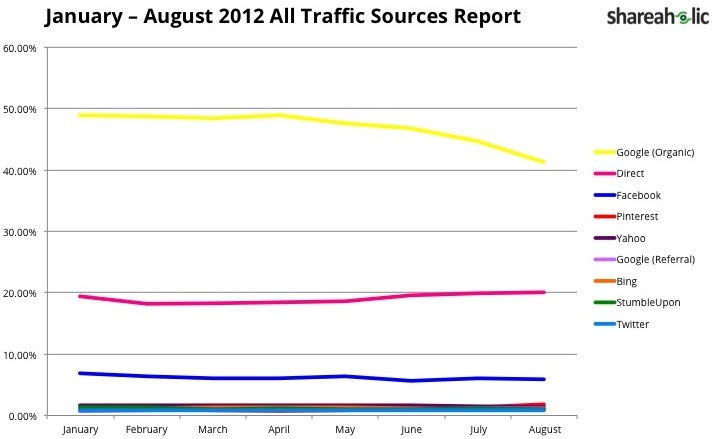 However, it’s still far, far behind Google organic traffic, as well as direct and Facebook referral traffic.